Fox News host and legal analyst Jeanine Pirro has found a lucrative side gig headlining Republican Party fundraisers. The network has claimed that it prohibits hosts from stumping for political candidates but has no apparent objection to hosts fundraising for party committees. That reported prohibition seems meaningless in the context of Pirro’s fundraising efforts. She has done at least 10 fundraisers this year for local Republican Party organizations that help elect GOP candidates, according to a Media Matters review. While campaign finance data for all of those events is not publicly available, Media Matters found that Pirro was paid for speaking in at least five instances by the hosting group, either through her corporation Judge Jeanine Pirro Inc. or the speakers bureau that represents her. Fox News and Pirro did not respond to requests for comment or clarification about the network's policies. Pirro was the headline speaker for the Alachua County Republican Party’s Ronald Reagan Black Tie and Blue Jeans BBQ in Florida on November 9. Pirro was the keynote speaker for the Volusia County Republican Party’s October 8 Lincoln Day Dinner in Florida. The organization paid a little more than $10,000 to Pirro for book purchases and her speaking fee, according to Federal Election Commission data. Pirro was the featured speaker for the Republican Party of Arkansas’ Reagan Rockefeller Dinner on July 28. The party disbursed $15,000 to Pirro, according to the organization's state campaign finance report. Pirro was the keynote speaker for the Monongalia County Republican Executive Committee’s April 21Reagan Dinner in West Virginia. 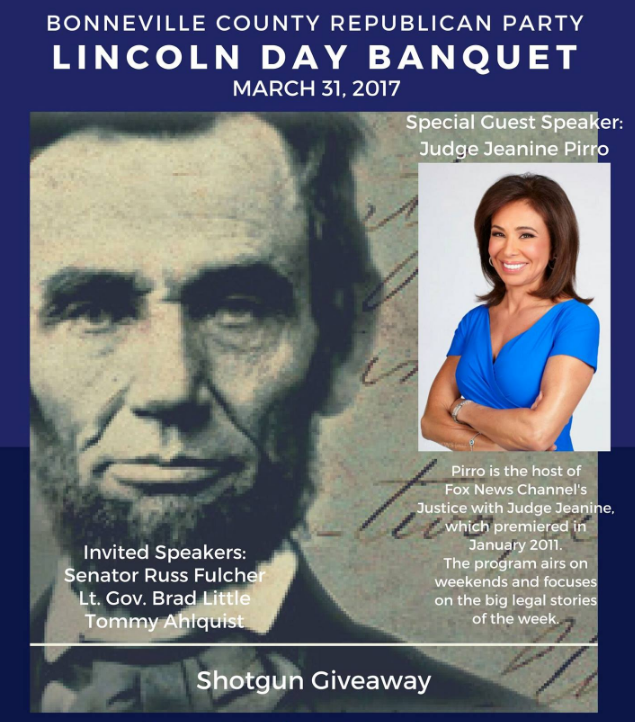 Pirro was the headliner for the Republican Committee of Lower Merion and Narberth’s Lincoln Day Dinner on March 20 in Pennsylvania. The organization paid a little over $5,000 for the appearance, according to the group’s state campaign finance report. Pirro was the featured speaker at the Columbiana County Republican Party’s Lincoln Day Dinner on March 23 in Ohio. Pirro was the special guest for the Erie County Republican Committee’s Lincoln Leadership Reception on March 9 in New York. The committee paid Pirro roughly $7,500, according to the group’s campaign finance report. Pirro was the keynote speaker for the Kent County Republican Committee’s February 18 Lincoln Day Dinner in Delaware. 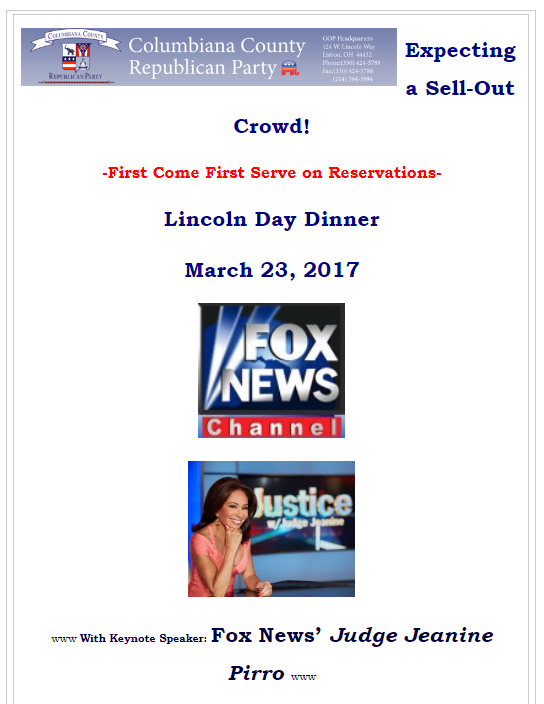 Pirro’s fundraising appearances will continue into 2018: The Sangamon County Republican Central Committee in Illinois recently announced that Pirro will headline the group’s February 8 Lincoln Day Dinner. Media Matters has documented how Fox News hosts and commentators — in addition to their on-air conservative rhetoric — actively help Republican-aligned groups grow their coffers at partisan events. The pro-Trump group Great America Alliance recently created a fundraising page prominently featuring Fox News’ logo and celebrating the news that senior adviser Tomi Lahren had been hired as a Fox News contributor. That page was taken down after Media Matters asked Fox News whether it had approved the use of its logo.